by Rob - August 15th, 2012. Filed under: Auroras, Awards, Canadian SF, Milestones, Wake, Watch, Wonder. To my absolute astonishment and delight, my twenty-first novel, Wonder, has just won the Canadian Science Fiction and Fantasy Award (“the Aurora”) for Best Novel of the Year. 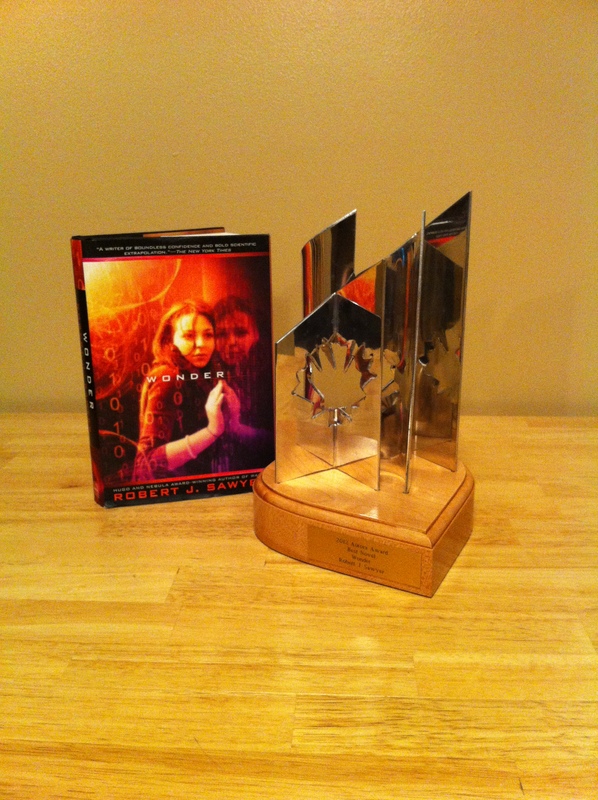 Mississauga, Ontario, author Robert J. Sawyer has done it again. Not only is this his third consecutive Aurora Award for Best English Novel, it gives him an Aurora for all three novels in his celebrated “WWW” science-fiction series. 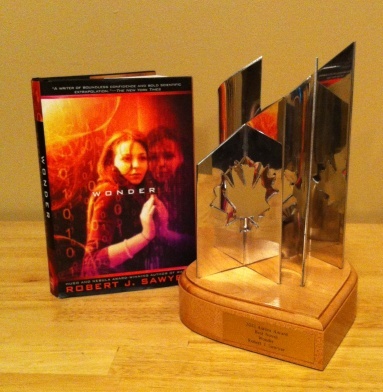 On Saturday night, August 11, 2012, in Calgary, at the Aurora Awards Banquet, Mr. Sawyer won the coveted award for his novel Wonder, the third volume of his “WWW” trilogy. Last year, he won for Watch (the second volume), and in 2010 he won for Wake (the first volume). 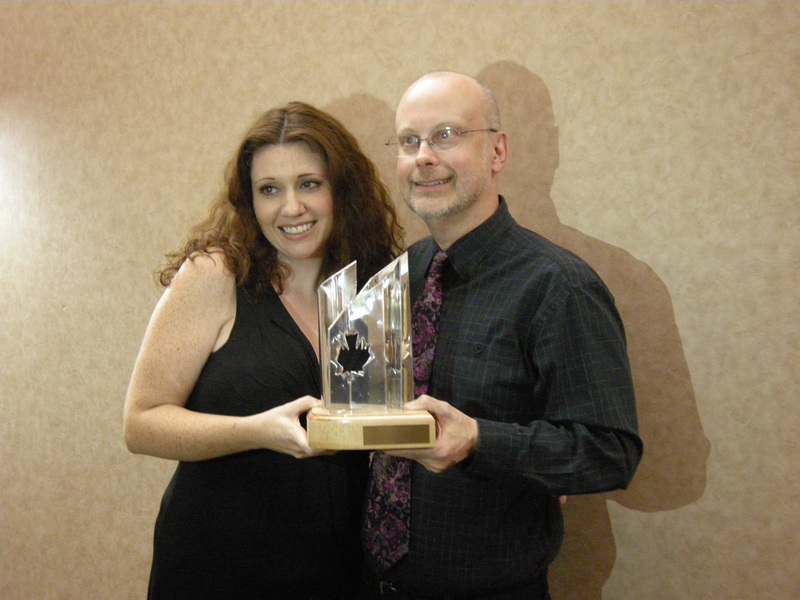 All three books are published by Penguin Group (Canada); Mr. Sawyer’s editor, Adrienne Kerr (pictured with Sawyer above), was present along with him at the ceremony in Calgary. Along with the trophy, Mr. Sawyer was presented with a cheque for $500 from SF Canada, Canada’s Science Fiction and Fantasy writers association. 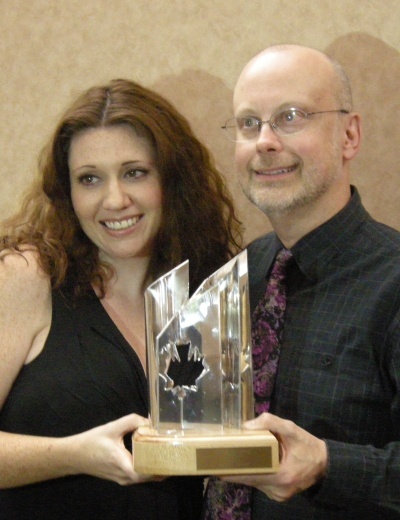 For over 30 years, members of the Canadian Science Fiction and Fantasy Association (CSFFA) have chosen exceptional Canadian works for these trophies. This year the awards ceremony was held in Calgary in conjunction with the When Words Collide festival. Wonder completes the story of Caitlin Decter, the formerly blind 16-year-old girl who discovers that a vast consciousness has spontaneously emerged in the background of the World Wide Web. She becomes Webmind’s mentor, protector, and public face. The WWW trilogy is published in the US by Ace Science Fiction and in the UK by Gollancz. The audio books are available from Audible.com (downloadable) and Blackstone (physical media), and all three novels were main selections of the Science Fiction Book Club. “For those of you science fiction fans who have yet to experience Robert J. Sawyer, you’re missing out on one of the most though-provoking writers in the genre. His narrative is a unique fusion of highly intelligent scientific speculation; emotionally-powered, character driven storylines; and offbeat humor mixed with subtle pop culture references. In WWW: Wonder, for example, Sawyer brilliantly references some iconic science fiction images  the Lawgiver from Planet of the Apes, The Six Million Dollar Man, Erin Gray from Buck Rogers in the 25th Century, etc. “Bucking the dystopian trend of presenting a world threatened by humanity’s own creations, Sawyer presents scientific advances in a kinder, gentler way. It’s key to his now completed trilogy  Wake, Watch and the newly released Wonder. “Fast-paced and immediately engaging. Drawing from and distilling a vast pool of scientific, mathematical, political and social theories, Sawyer educates readers on such topics as game theory, government conspiracy, scientific responsibility and modern morality, while encouraging them to ask questions. “Once again, Sawyer shows mastery in his ability to move between complex scientific concepts and genuine and realistic characters … and serves up a healthy dose of social commentary and critique. Kerr and Sawyer photo by Tim Reynolds. Trophy photo by Robert J. Sawyer. Click on photos for high-resolution publication-quality versions. Congratulations on this one, Rob! Awesome. 3 for 3 for the Caitlin and Rob team! Congrats, buddy. Well done Rob & Caitlin.